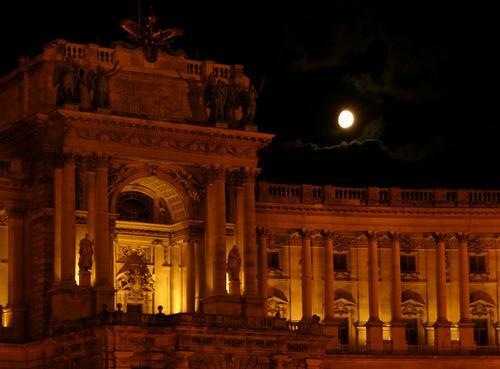 Vienna is one of the most beautifully lit cities in the world at night. The scale of the architecture is majestic and lit well at night one feels that one is wandering through the 19th century on the night of a great ball. As I rode past the National Library tonight the moon peeked out from behind dense clouds. I shot at ASA 50 as I loathe digital noise. I was concerned about getting a steady enough shot without a tripod but my bicycle saddle was perfect against a lampost. I was on my way home from an open-air concert at the Rathaus summer film festival put on by the IMZ and the city of Vienna. It is one of the strangest film festivals in the world – showing only opera and ballet films for two months outside for free. Both the opera and the ratatouille were excellent. The opera was a silly piece of work called Giuditta by Franz Lehár. A sad and happy romance of a soldier named Octavio. The opera was in German and I am beginning to think that German is the ideal language for opera. The songs are convincing and robust. There were quite a few dramatic, spoken interludes which were well-enough acted by Mehrzad Montazeri and Natalia Ushakova, falling into one another’s arms and speaking and singing of true love. To my shame, I must admit that I enjoyed the show. The set was spectacular as well. An entire desert oasis built outside in a massive auditorium complete with soldier’s tents and combat jeeps.